5 Reel Drive Video Slot Review - Casino Answers! 5 Reel Drive is a 5-reel, 9-line video slot developed by Microgaming, featuring a wild symbol and scatter wins. You can play the 5 Reel Drive video slot at Bovada. The 5 Reel Drive casino game is a quarter slot. Bets on the 5 Reel Drive slot machine are $0.25, $0.50, $1 and $2 per line. You can select up to 9 paylines per spin on the 5 Reel Drive online slot. The maximum total bet on the 5 Reel Drive video slot is $18 per spin, which is a low betting range for casual slots players. To play the 5 Reel Drive video slot, select your bet and press the “Spin” button. To play all 9 lines on the 5 Reel Drive slot game, hit the “Bet Max” button. The Flaming Wheel symbol is the top-paying symbol on the 5 Reel Drive slot game. If you hit 5 Flaming Wheel symbols on a selected payline, you will win the 10,000 coin top jackpot. Other high paying symbols on 5 Reel Drive include the Red Trucker (1000 coins), Yellow Hot Rod (900 coins) and Pink Hot Rod (800 coins). The Road Sign symbol is wild on the 5 Reel Drive video slot. The Road Sign symbol will substitute for all symbols on the 5 Reel Drive slot game, except for scatters (which pay any). 5 Reel Drive’s scatter symbol is the Cop Car symbol. 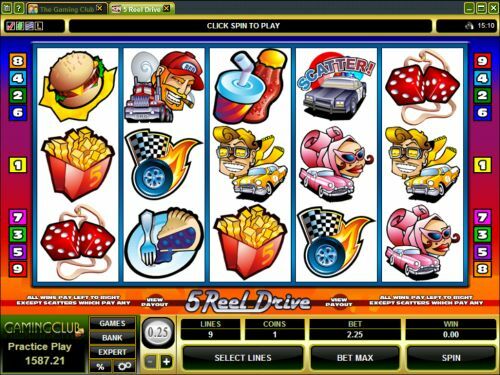 If you land three or more Scattered Cop Car symbols anywhere on the reels of the 5 Reel Drive slot game, you will win up to 50X your total bet. 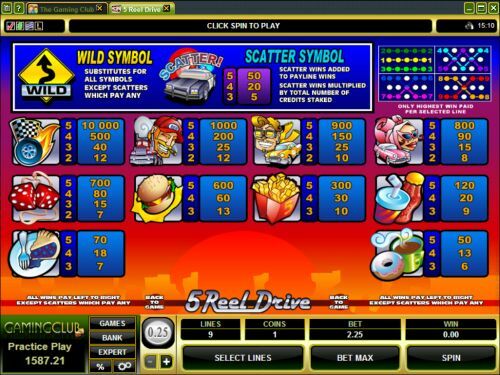 The 5 Reel Drive casino game has an autoplay mode with advanced settings. To access the 5 Reel Drive slot machine’s autoplay feature, hit “Expert” and you can play 5 or 10 autoplay spins or hit the “Auto Play” button to open up advanced settings. You can set the number of spins (5, 10, 25, 50, 100, 250 and 500), number of seconds between spins (0, 0.25, 0.50, 0.80 and 1.50), stop once all spins are complete, stop when jackpot is won, stop if a win exceeds or equals ($25, $50, $100, $250, $500, $1000 and $2500), stop on any win and stop if credits increase/decrease by ($25, $50, $100, $250, $500, $1000 and $2500). You can stop autoplay at any time on the 5 Reel Drive slot machine. 5 Reel Drive is a barebones type of video slot without any real special features. You can play the 5 Reel Drive video slot for real money at Microgaming online casinos such as Bovada. Can United States players play the 5 Reel Drive video slot for real money? No, American players cannot play the 5 Reel Drive video slot for real money. Instead, we suggest you visit a USA-friendly RTG online casino like Bovada or a Top Game casino like Bovada. Where can I play a free flash game of the 5 Reel Drive slot game? You can play a free flash game of the 5 Reel Drive online slot at Bovada. You can play for free or real money. If you have any issues with the free flash game, try updating your version of Adobe Flash Player. Where can I play some more racing-themed video slots? If you’re looking for another racing-themed slot game, you can find all of them in our complete list of racing slots. Is there a progressive jackpot on the 5 Reel Drive video slot? No, 5 Reel Drive is not a progressive jackpot slot. However, there is a version of the video slot called Mega Moolah: 5 Reel Drive that is linked to the huge Mega Moolah progressive jackpot at Microgaming casinos. To play the Mega Moolah 5 Reel Drive progressive jackpot slot, please visit Bovada.